I don't know about your camper but removing the fuse would do it the only problem would be if there was some thing else on that fuse it wouldn't work either other wise open the outside door to the heater and disconnect the connection to the heater controller. Mainah...and what would the heater controller look like? There is a connection to a small panel that has a rubber "boot" over it..could that be it? I moved your post to a new one so it does not get buried in Jerry's HW heater fix it post. 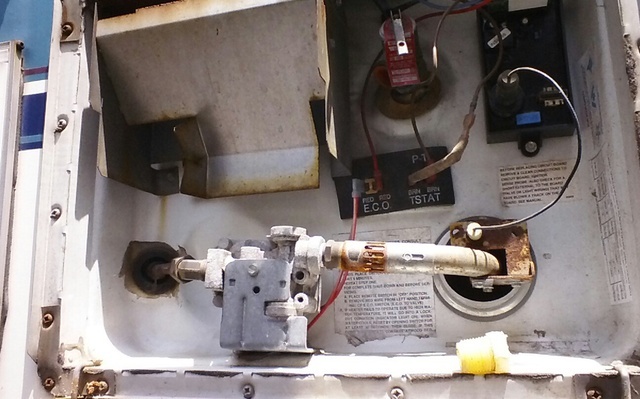 Help us understand "which" hot water heater in which camper you are talking about. I thought you had a Coachman motor home now. Do you have the year of the heater and or model number? and better a pic looking at the outside of it with the cover down. If it is an Atwood and a more new one, there is the gas side (you talked about the ignitor") and then the 120 VAC electric side. In your case, you want to stop both sides from working so an accident does not happen. Reason for knowing the year of the model as if it is an Atwood in late 2003/early 2004 models they changed the way the electric element was integrated into the system. On these newer units it is easier to disable the entire heater at the heater control board. We can tell you which connector to unplug. If this is a pre 2003 Atwood, then the electric element part is totally separate from the gas control and we need to address that differently. Give us some tech data of what make, model and year of HW heater and we can help better get you fixed up quick. I looked up your profile, is this the 1998 Coachmen MH? Again need the Make, model and year of the heater in case the prior owner change it and take a pic on the heater outside the camper with the cover down so we can see the heater internals. I do not know if Coachmen used a Suburban or and Atwood HW heater. While the basic concept is the same, they are different products. The model number of my 1998 Coachmen Atwood propane only ,water heater,posted above.Now I am trying a picture..stayed tuned!! John..as I mentioned earlier,there is a wire going from the ignitor to a board (upper right)and it has a black boot covering that end...is this what I would disconnect at the boot end? At least that's what I,in my limited electrical knowledge,has figured out! LOL!! Can you just disconnect the wires in the switch inside the coach? This way you don't have to worry about shutting down the gas if you disconnect the igniter. Try using the u-shaped clamps used for electric cables on the side of a house. They are different widths to cover just one switch on the panel. You could still access the switch by putting your finger inside the clamp (like a trigger guard). Will check out that possibility..thankz! You have both 120 volt heater and gas. If you remove the red wire marked ECO that will defeat the gas valve if it's not plugged in the electric heat will not come on and they usually have a separate switch. If you are parked why not just fill the tank? Mainah...my WH is gas only, not combination. I don't use the water heater as I mentioned before,so the water gets very rank sitting here in the heat. I try very hard to not use the camper water to drink..DH doesn't understand that...so sometimes he drinks it if I'm not watching closely. It's a very difficult situation I have here...it is easier to bypass it than to drain and flush every so often. I will probably just cover that switch until my nephew disables it.